SpyStudio lets you trace almost any process you want at almost any moment of its execution, but sometimes you don't need information on all the calls in the life cycle of the process or, for some reason, you can't start or stop the process freely. 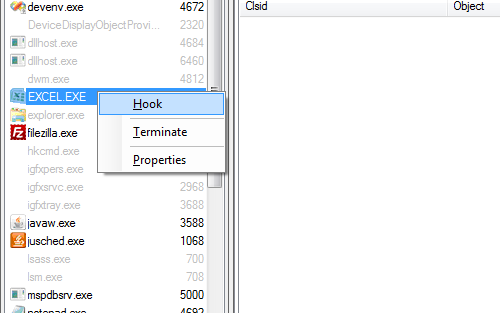 In this tutorial you will learn how to hook a process which is already running. Select the processes that you want to intercept and open the context menu to hook them as seen in the screenshot below. 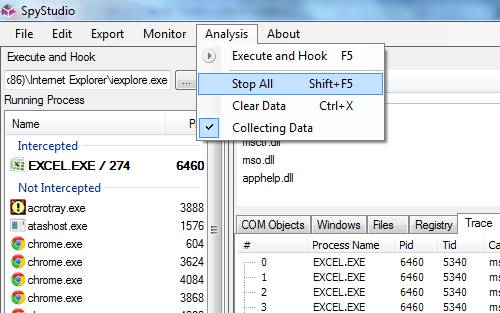 To stop monitoring all processes, just open the 'Analysis' menu and select 'Stop' as seen below. Also, you can stop monitoring specific processes by selecting them in the processes pane and using the context menu.